On a direct course quickly into the city or out into the regional area – that is the goal of the project “Die Kombilösung”. Its aim is to improve rail-based public transport and make it future-proof. For this purpose, the lively pedestrian zone will be equipped with a tunnel for light rail vehicles and trams with the innovative concept of the combined solution by the Karlsruhe rail infrastructure company KASIG. Rail traffic will thus disappear from aboveground. In the area of ​​the central Kriegsstraße, a tram route between cycle paths and tree avenues will be built from 2021 onwards. Underneath, a continuous car tunnel will lead from the Karlstor to Mendelssohnplatz. Thus the cityscape will be freed of cars. Entrances and exits for city and local traffic are planned in the area of ​​Karlstor and Ettlinger Tor. Above it lies the public transport route, which allows passengers to reach their destination faster, more punctually and more safely. For residents, commuters and visitors of the city this offers an immense improvement. The construction of the tunnel, which takes place in open construction, began in the summer of 2017. 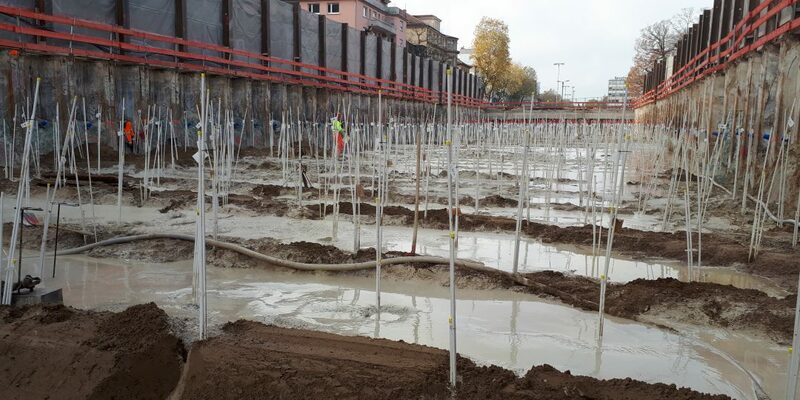 The excavation is sealed by means of a sealing wall, a wall of adjusted, rear-anchored sheet piling and a soft-gel sole. The installation of the sealing sole is carried out by means of injection-lances (see Figure 1), which are brought in via flush drilling methods. There are nine excavation pits in total. The completion of the last excavation is scheduled for late 2020. Two injection containers with six or eight pumps are in operation day and night in order to operate on the construction fields in the corresponding construction period. The ARGE TKS Karlsruhe manages to process around 200 packer positions per day. A huge amount of data must be processed and documented accordingly. The sealing of two fields has already been completed, documented with state-of-the-art eguana SCALES. Thanks to eguana SCALES, arising problem areas have been analyzed and resolved quickly. During this highly innovative project, the responsible authorities rely on the latest technologies. The monitoring and construction site communication has been extensively digitized using eguana SCALES. The cooperation between construction supervision and consortium takes place via this monitoring system. All work is digitally tracked – without unnecessary paperwork or manual, analogue protocols. eguana SCALES processes the construction data directly and digitally and outputs it for all parties in the familiar file format and via intuitive visualization on the eguana web platform. This way, construction supervision can directly view and check logs of completed work in the system. For already completed construction sites, communication between construction supervision and ARGE was mainly handled via the protocols of eguana SCALES. So as not to lose track of the numerous injection points, eguana MAPS provides an overview of objects and data. The statuses of these injection points are recognizable by different color codes. That way, it is easy to identify points that are still being worked on as well as sites that require further scrutiny. The execution of a soft gel sole splits in two steps – the introduction of the soft gel and above it the injection of the so-called “lid” with cement grout. With a large amount of injection points, it is necessary to know when the injection of soft gel can be started in various sections. 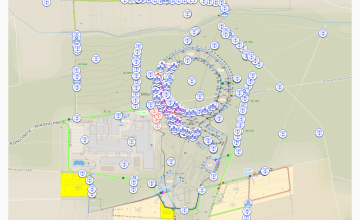 Thanks to the visualization provided by eguana MAPS, site managers have the opportunity to easily identify which areas of the construction area are ready to be applied and can coordinate this from the office – or on weekends even from home – and control the entire injection process specifically. For the time being, the sealing work has been shut down after the completion of the second construction field. 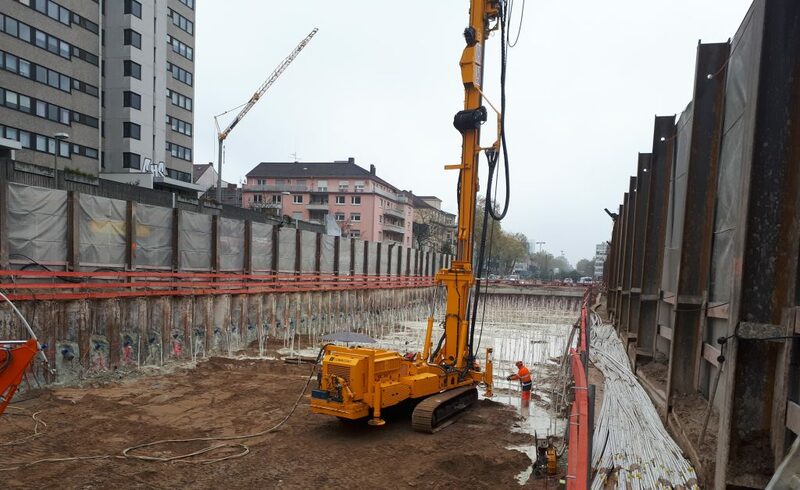 In a few months, water has to effectively and reliably be kept away from the next excavation pit – no problem for the ARGE TKS Karlsruhe and eguana SCALES.